The weather this week was mostly in the low to mid 70’s and had one rain even with winds & a slight cool front. The nights were cool and a slight change in the foliage gives every indication that fall is very near. 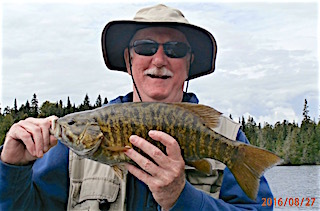 As for the fishing all guests enjoyed catching many Northern Pike & BIG Smallmouth Bass along with a Muskie or two. Joe & Marilyn Foos from Alpharetta, GA returned for their 7th visit with us at Fireside Lodge. 1st day was very good fishing catching over 30 Smallmouth Bass. 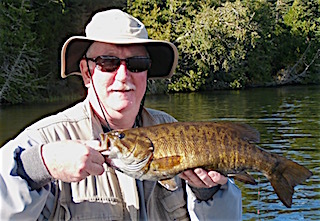 2nd day they had another great day Smallmouth Bass fishing using a slow surface presentation with a wake bait. 3rd day was slower and Marilyn was bummed after losing her favorite bass lure to a Northern Pike. 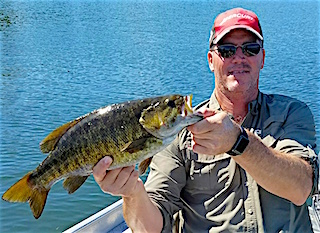 4th day was another great day for Smallmouth Bass fishing catching a lot of quality size fish. 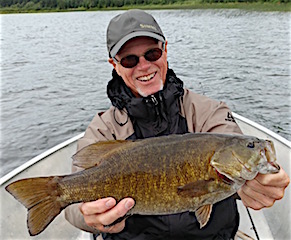 5th day was all about catching many bigger Smallmouth Bass their current favorite lure, The Wave Bait. It runs to about 6ft deep max but Joe & Marilyn have been working it on the surface with a very slow retrieve giving the lure a slow walk the dog presentation which is effective over weed beds without getting hung up. 6th day was an unusually slower day for them but the 7th day they had a hot bite in the morning then a lull, then having great action later in the day. 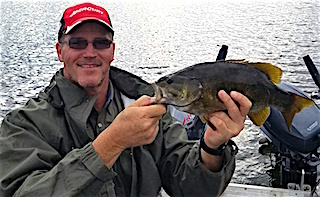 8th and final day was not fast action but they caught several good size Smallmouth. Both had a great stay & hope to return soon. Pat Hobson from Elwood, IN and best friend Larry Hinshaw from Blue Grass, IA returned for their 9th visit. 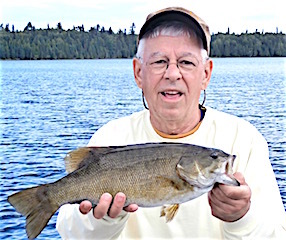 1st day was about BIG fish as Larry caught an 18” Trophy Smallmouth Bass and Pat caught two measuring 18 & 19”. 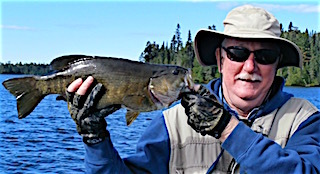 2nd day Larry seemed to have the hot hand catching Smallmouth Bass into the 17.5” range plus 5 pike. 3rd day had them catching 14 fish on post cold front conditions including Pat landing 2 trophy Smallmouth Bass at 18 and 19.5-inches. 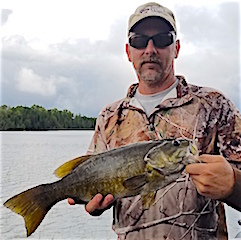 4th day was a portage day for Smallmouth Bass hoping to replicate a day they had in the past where they caught over 40 BIG Smallmouth Bass, but the fish were not that cooperative today. As they say that’s why it’s called fishing not catching. 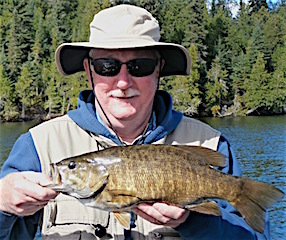 5th day they lost a half-day fishing however they still caught some nice Smallmouth Bass, Pat seeming to have the advantage on larger fish. 6th day they really got into the Northern Pike saying they caught as many as they wanted to but lost actual count. 7th day a good cool front moved in with heavy rain which put a damper on the day. 8th day they had a great day catching a mix of Northern Pike & Smallmouth Bass. 9th & final day it poured on them for a few hours but they made the best of it catching their favorite target, Smallmouth Bass. Return guests from 1998 Bob & Sandy Veitch from New Wilmington, PA and Carolyn Mullinax from Fort Wayne, IN were glad to be back. 1st day fishing they really enjoyed getting back on our waters to rediscover what they learned 18-20 years ago. It was a very windy day causing some boat control issues, however they did catch Pike. 2nd day they waited out the rain until after the noon hour to fish and had a good time catching Northern Pike. 3rd day 4th day were spent fishing for a catching some Northern Pike. Bob really wanted to duplicate what he did on his last stay with us, which was catching a Trophy Muskie & making front billing on our brochure. That did not happen but it was not for lack of trying. The last day they faced heavy rain plus a cold front, and after the noon hour they waved the white flag and came off the water. 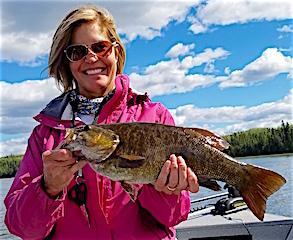 All had a fabulous time enjoying the sport they love, fishing, while absorbing all the wilderness atmosphere and wildlife that surrounds us at Fireside Lodge. We thank them for returning to see us and hope to see them again. Ed Tieman & Dan Brennen from Cincinnati, OH were thrilled to be revisiting us from their last visit in the 1990’s. They have of recent years started fishing in kayaks so they brought them along as an option. 1st day they opted fishing in a boat as it was a rainy cold front day and they did well considering the conditions catching both Smallmouth & Pike. 2nd day was a Kayak day portaging from Back Bay to Portage Bay to fish the Upper Arm of Little Vermilion Lake. 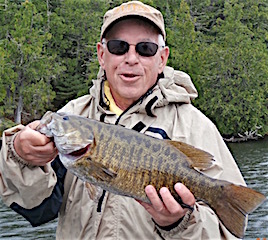 They did very well with Ed catching several 17-17.5” Smallmouth plus he landed an 18” Trophy. 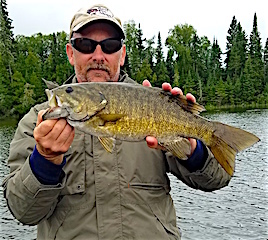 3rd day was even better catching many Northern Pike & Smallmouth Bass with Dan catching an 18” Trophy, plus Ed caught 3 at 18, an 18.5, and a MONSTER 19.5-inch Smallie and had one at 17.5”. 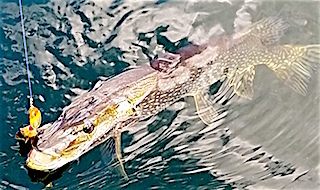 4th day they had terrific Northern Pike fishing catching 37 along with lots of other action. 5th & final day was spent on another portage lake catching some fish and enjoying the final hours in the wilderness they enjoy so much. John & Nancy Czernek from South Carolina, were visiting us for the first time. 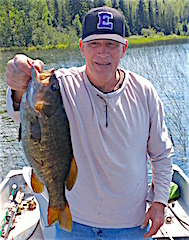 1st day they enjoyed catching Smallmouth Bass the simple but forgotten way, using large minnows on a jig. 2nd day John & Nancy had a good day catching Smallmouth Bass and Nancy had a nice Muskie follow her lure right to the boat and just hung out for a while, until it slowly swam away. 3rd day in pursuing the fish of a lifetime they again had some Muskie follows that seemed interested but not aggressive. 4th day they again found Muskie having some nice follows but just could not hook up. 5th day was met with heavy rain followed by a cold front having some Muskie follows and catching some Pike. 5th and final day the weather rebounded giving them a good last fishing day and a nice send off until the can return. Return Guests Rick and Nancy Hoffman from Olathe, KS were glad to be back. These two have been fishing here for a long time, first time being 1985 and Nancy has been fishing here since she was a young girl. 1st day was GREAT catching 27 Northern Pike while having other action on hook ups and lost fish. They really enjoyed the creek ride and seeing white & yellow water lilies in full bloom. 2nd day was even better catching over 30 Northern Pike fishing on the windy side of the Little Vermilion Lake. 3rd and final day was their best yet catching 35+ Northern Pike up to 31-inches before 4PM as they had to leave at 5:30 to catch an early morning flight home the next day. Both had a fabulous time and will return one day in the near future. Jim and Kim Thomison from Silver City, NM were visiting us at Fireside Lodge for their first experience. 1st day was very fun taking a creek portage to an out lake catching about 20 fish, with Kim stealing the show catching the biggest Smallmouth Bass at 17.5” and the largest Northern Pike. Side story was when Jim rigged a plastic worm Texas style to teach Kim how to use it, on her first cast as Jim was describing the technique, Kim hooked into and landed the largest Smallmouth Bass for the day. Great teacher and fast learner. 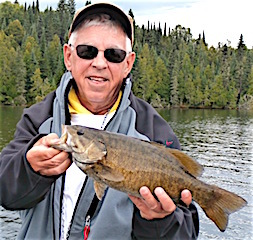 2nd day they did well catching more Smallmouth Bass with Jim catching the bigger fish today including two Master Anglers Award Trophy Smallmouth Bass measuring 18”. That evening while fishing for Pike & Muskie Jim had a BIG fish on which they both got a good look at as it jumped & completely cleared the water before cutting Jim’s line with one quick shake of it’s head. 3rd day they caught 12 fish being a mix of Smallmouth Bass & Pike. 4th & final day was spent fishing and soaking up the scenery & wildlife. Kim’s goal was a Muskie which just was not in the cards, but gives them every good reason to come back to try again. Long time guest Bill Aulenbach from Barberton, OH was thrilled to be back after a two-year absence. Bill is 83-years old and in fantastic shape. In fact he just retired this year but is already arranged to start working on a special project for the company he worked for 60-years. Congratulations to Bill on his retirement. Bill has come with groups of 4-6 people, & his son Michael in the past, plus several times by himself. 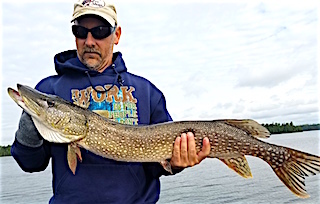 Bill is a toothy critter guy always shooting for a Trophy Northern Pike or Muskie, coming close a few times with his personal best being a 39-inch Pike. 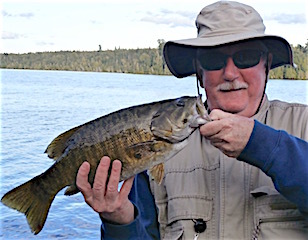 Bill had a wonderful week catching fish and being where he loves to be; out on the water among the quiet wilderness we have at Fireside Lodge. Bill left saying that he now has a year to work on getting hos son Mike to return in 2017. Fishing at Fireside Lodge for there first time were Keith Dedrick & Scott Link from Avilla & Huntertown, IN. DOA they caught a good number of Smallmouth Bass before suppertime. 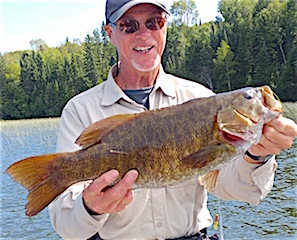 1st day they also caught a lot of Smallmouth Bass, most being larger and 5-6 in the 17-17.5” range and Keith caught a HUGE 40-inch Muskie that was remarkably fat and the picture verifies that story. 2nd day was also good catching some bigger Northern Pike and some Smallmouth Bass and I found out that Scotts go to lure was soft plastic spinner frog not only for Smallmouth Bass, but some bigger Pike & Muskie bit him off several times. 3rd day was another very good day catching Northern Pike up to 36-inches, Scott landing a BIG 38-inch Pike, plus some nice Smallmouth Bass. Scott caught two trophies both measuring 19-inches. 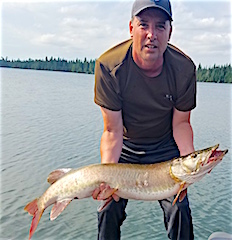 One great story is when Scott was using a suspending twitch bait a big Muskie attacked his lure biting through his line. Scott then watched the Muskie spit it out and with the lure just suspending in the water and slowly moving the Muskie attacked it again only to spit it out a second time and swam off. Good news was Scott was able to reach down with the net and retrieve his lure. 4th and final day they had another very good Northern Pike day catching many until about 1PM. Both left have a great time as said they will return.